Just a quick post today to celebrate Mojo Monday. 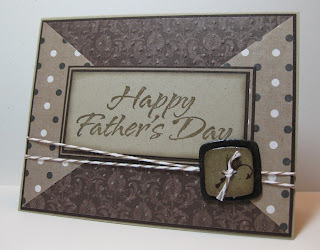 ﻿I thought I had already made a card for my FIL, but I was unable to find it anywhere. This sketch worked out perfectly, even though my measurements are way off. I think my adaptation worked fine. 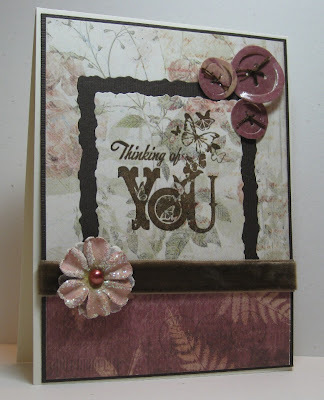 I must be going through a phase, my embellishment of choice for quite a few of my cards lately is Sizzlets buttons. In most cases I am embossing them withVersamark Dazzle (champagne or frost for sparkle) and using clear embossing powder. Today I stamped a small fishing fly on the button, I wish it showed up better in the photo but I have not really gotten the hang of using the macro feature on my camera yet. 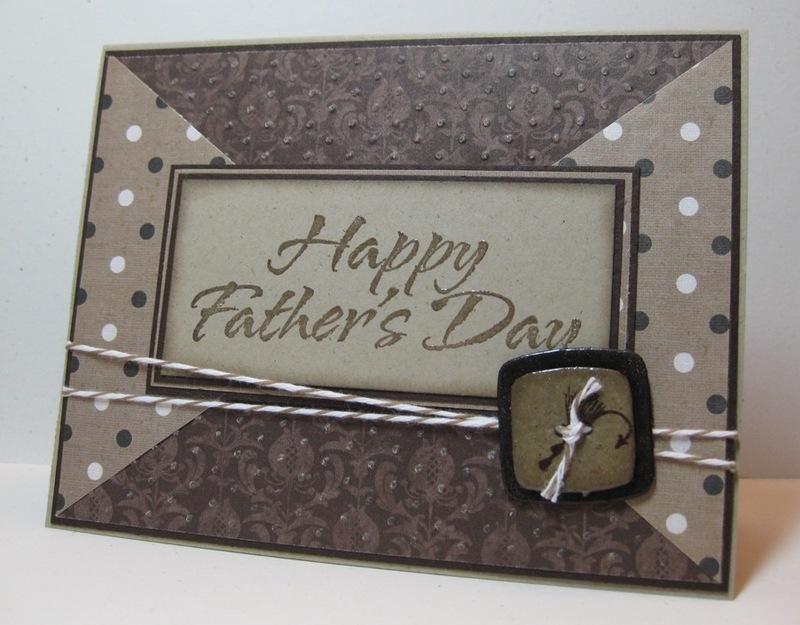 Supplies: Craft and brown cardstock, Designer Paper-Hot off the Press, Impression Obession- Happy Father'a Day, Magenta- Fishing Fly, Sizzlets button, misc twine, Cuttlebug-Swiss Dots. 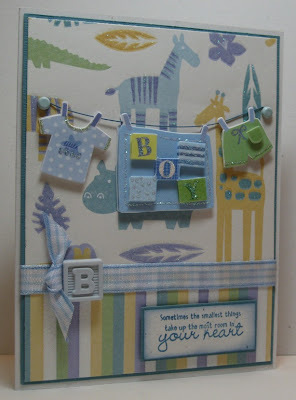 I recently made two baby cards, one for a girl and this one. Of the two this is one is my favorite. 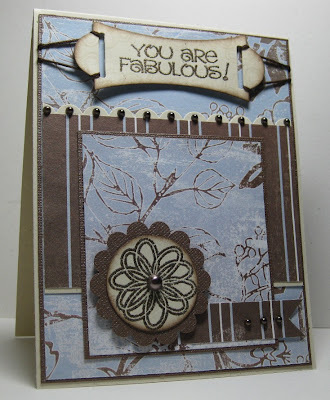 I love those little embellishment packs from Daisy Hill, I brought 2 or 3 of them a couple years ago and tucked them away they really do make a card easy to put together. 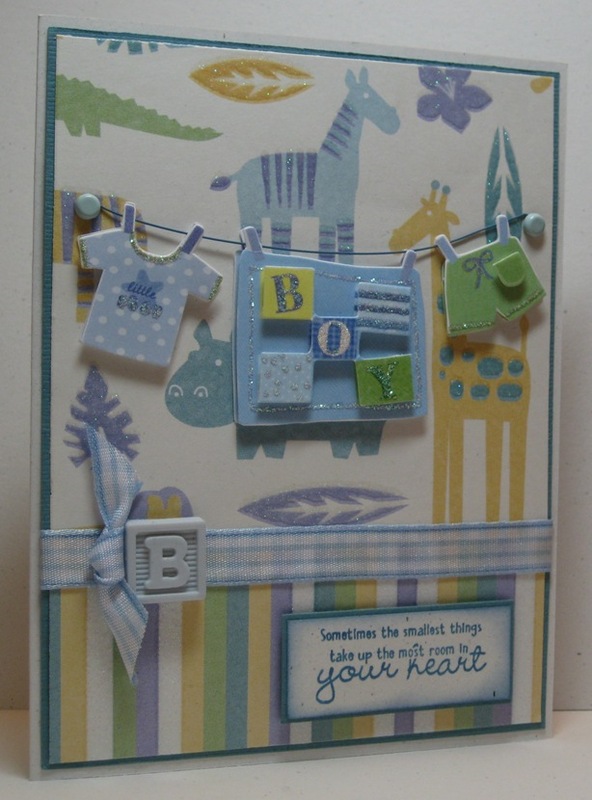 I started with Designer Paper- Nana's Nursery from DCWV, they matched up my cardstock. There is glitter on the Designer Paper, that matches very nicely with the embellishment cloths line. Supplies:Cream and blue cardstock, Designer Paper-DCWV, There She Goes-Bit of Stardust, Daisy Hill-Embellishments, Jolee-buttons, misc ribbon. I am trying something new. I joined http://www.papercraftplanet.com/ last week and clicking my way through looking at all the wonderful information I found myself at http://www.stampingwithbrenda.com/. This is where I found Clean & Simple Sunday Challenge #13. I have never really been very good at clean and simple so what a great way to inspire myself. I did not do a very good job taking this picture. I know the sketch shows a flower and I did try, flowers were not in my scope though this week as nothing.. I mean nothing looked good. So a double layered button is what stuck and I think it looked good with the Memory Box Pixie designer paper I used. I threaded the buttons with some brown and pink embroidery floss and popped both layers up with foam tape. The buttons are embossed with clear embossing powder to give them gloss. The sentiment is also lightly embossed. Supplies: Cream and pink cardstock, Designer Paper-Memory Box,GStudio-Hello, EKSuccess scallop edge punch, misc ribbon, Sizzlets buttons. Happy Victoria Day, I love long weekends :) A very quick post for Mojo Monday. 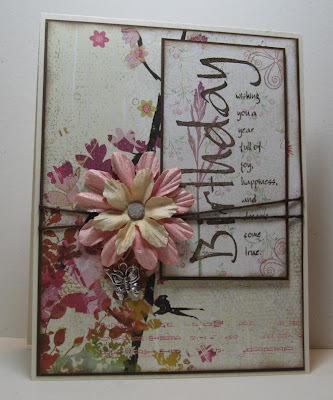 I am not entirely happy with this card, I wanted to use a flower but could not find anything that flowed with the card. I used a Clear Star Jelly roller to add sparkle to the tips of the petals. I used a brown sugar coated brad to hold the flowers together and to anchor the charm that I used in place of a tag. Supplies: Cream and brown cardstock, Designer Paper-Memory Box, Paper Inspirations- Birthday Joy, misc floss, misc butterfly charm, Prima flowers. Happy Sunday, sorry I have been MIA this week. Time is doing that darn flying thing again. Last weekend I had the fabulous opportunity to meet and get together with some ladies I met on a Stamp TV group. 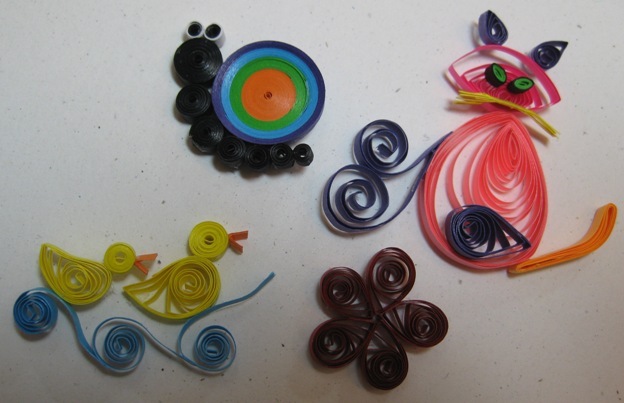 One of the ladies taught us to quill and although I did not make a card, we did make samples of all the quilling shapes. By the end of the day we had used those shapes to create some small items such as a flower, a couple of ducks, a snail, and a cat. My son questioned whether I was sitting too close to the glue while I was making the cat. I had a small sample kit of quilling paper that I was using, I was running out of paper by the end of the day which is why my cat is so interesting looking. I can’t wait to get together with the ladies again, we have another meet and greet in June with hopefully some additional ladies join us. My sister Barb, was so patient with me while she waited for my Mojo for this week. I am glad that she posted early on because I only finished the card today. I did have a good start on it back on Monday, but then I realized that the card was for my husband and that I could not post it as he consistently checks my blog to see what I am creating. So with what I already had started I shifted focus and made it into card for my friends son whole will be turning 17 in June. When I asked his mom what he was interested in now her comment was ‘he is such a redneck’. I have no idea of her interpretation of that so I took it as an outdoorsy type of fella. The last time I saw him he was where a rugged dirty ball cap, big work boots and a tartan work shirt, I hope the card works :). My card is slightly different then the sketch, I re-worked it a bit. I have quite a few layers to add dimension. I won't go into detail but one focal point is the large Sizzlet button. I dipped it in Versamark Champagne dazzle then coated it in clear embossing powder to give it gloss. 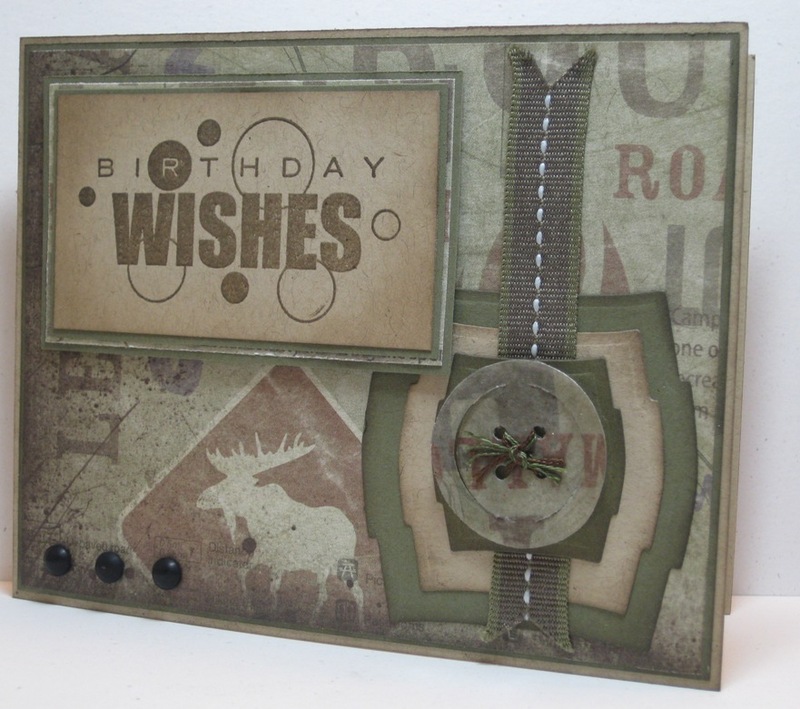 Supplies: Craft and green cardstock, Designer Paper-Karen Foster Designs, Inkadinkado-Birthday Wishes, Sizzlets-buttons, Spellbinder Nestabilites, American Craft ribbon, Pebble inc-Candy dots. I will be back tomorrow with the new Mojo. Happy Friday, I am looking forward to this weekend so much. I am hoping for sunny skies for some much needed gardening. A family member had cataract surgery this week. I thought this cheery bright card would make her smile. I have been leaving these K&Company Designer Papers at the top of my pile for a while now but not sure what to do with them exactly and I am happy with the way the card turned out. I embossed the image with clear embossing powder so that I could do a resist with the Versacolor’s that matched the paper and cardstock, the resist is brighter than the image shows. 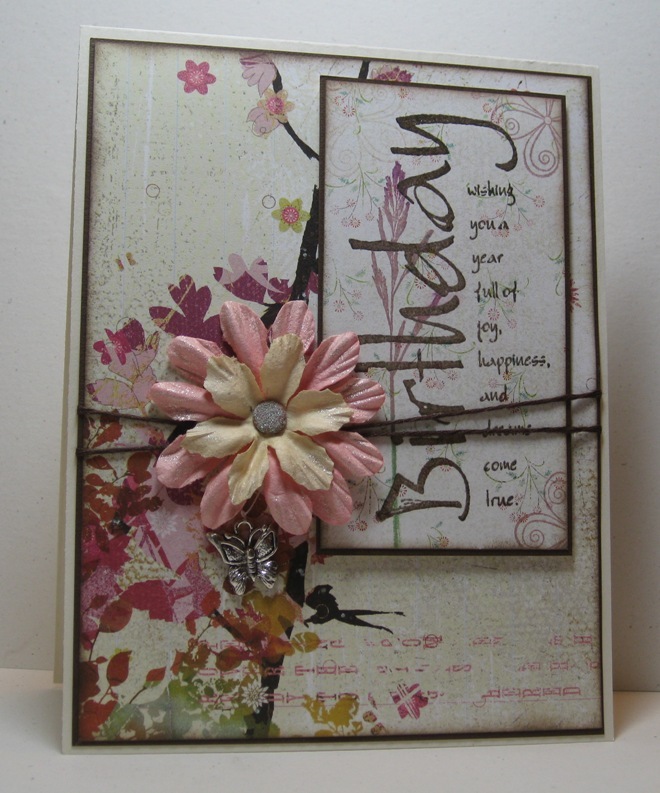 I love the way this soft mesh ribbon curls, it give the card a soft look. I finished with Hero Arts dots and a pearl. 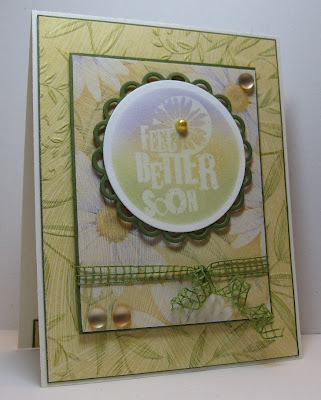 Supplies: Cream and Green, Designer Paper- K&Company, Inkadinkado- Everyday Expressions, Spellbinders-Lacey Circles, Hero Arts-Dots, Kaiser Craft pearls, misc ribbon. Mid-week, I love it. Rumor has it that we will have sun for the weekend plus, there is a get together this weekend for a few ladies from a StampTV group, it will be the first time we are all meeting. I have to say it is pretty fabulous that strangers can get together for a common interest. I hear that this card arrived safe and sound to it's recipient :) so I can post.This is the April stamp set from The Stamps of Life, I am pretty happy that I was able to use it right away. 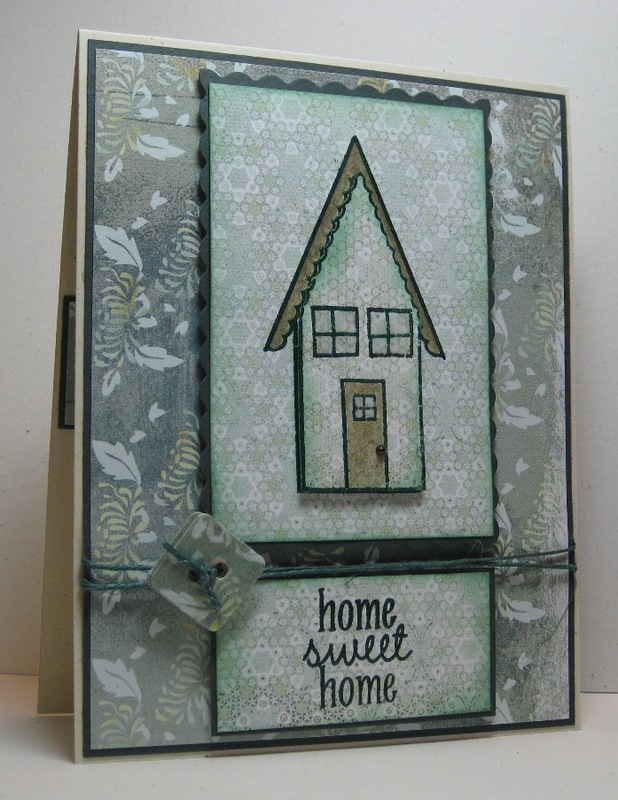 Supplies: Cream and green cardstock, Designer Paper-Memory Box, The Stamps of Life-houses4us, Sizzlets-buttons, misc twine. Welcome to another week, one day closer to summer. I can almost believe it with the sun making a short appearance this evening. It is Mojo Monday today, I have to say I was excited about the sketch this morning when I saw it. I still am, although I am not all that happy with my card. Oh well, the wonderful thing is I can try again. 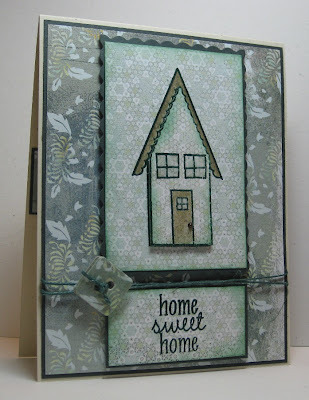 I wanted to use this double-sided paper by Prima, I am really only fond of one side but not so much the other side and maybe that is why I was not feeling as inspired as I had hoped. Supplies: Cream and brown cardstock, Designer Paper- Prima, Inkadinkado-Everyday Expressions, Spellbinders- Nestabilites, Prima- flowers, Sizzlets-Buttons, Kaisercraft pearls, American Craft-velvet ribbon. There is a lot going on this weekend. Happy Saturday, some people will be all excited about National Scrapbook day, and some lucky moms will be spoiled rotten for Mother's day tomorrow. I am not a scrapbooker but I do enjoy playing with my paper and glue so I can feel an affinity, so I was feeling creative this morning and made a card. I am fairly certain that the recipient will not be reading my blog so it is safe to post. As I was flipping through my designer papers looking for something for a masculine card and I found these. The background is ugly on its own... so I have no idea why I was drawn to it. The card itself turned out great though so it is not a complaint. I started with layers and then I inked up the stamp with Versamark first, then 4 colours of Versacolor and embossed with clear embossing powder. Then finished by adding some final touchs with floss and mosaic tiles. 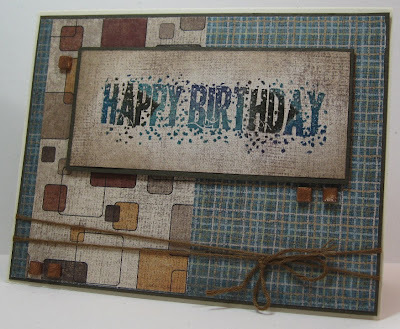 Supplies: Natural cream and brown cardsrock, Designer Paper-Hot off the Press, Inkadinkado-Everyday Expressions, Seweasy floss, Versacolour inks, Crystal stickers-Mosaic tiles. In honour of National Scrapbook day, my talented sister Barb is offering a digital freebee so check it out. I know I am a little behind with this card with it being a Easter card but I still wanted to post it. It is very simple but I my son loved it. I stamped the bunny on designer paper then colored his ears, nose and the pads of his feet with pink glitter marker. 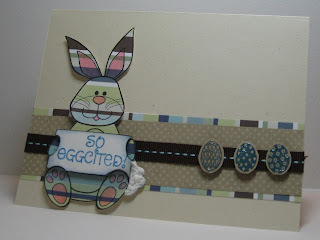 I stamped So Eggcited twice so that I could pop it up with foam tape. The Easter eggs are stamped with Versacolor Lapislazuli then embossed with clear embossing powder. I finished by adding Perfect Puff to give him a fluffy tail. Supplies: Kraft cardstock, Designer Paper-Memory Skor, The Stamps of Life-bunny4Easter, Perfect Puff, misc ribbon. I was suppose to post a card today, my husband was in command of the computer last night so I did not get the chance to prep it. I know that is not an excuse and I will try to get it done tonight. In the meantime, this post is for Valinda and well anyone else who is interested. When I first was introduced to stamping it was with a friend, she had a grand idea of us selling our cards. So at that time I looked into packaging. I found this great website called Cardblanks . Even more wonderful is that they are local to Victoria. Yaayy. They do ship with in Canada and the US though. and harder plastic box-like cases as well for small card sets. I have not sold a card to date, however these work great for protecting and storing cards that I have not given out yet. I don't seal them when I use them so they can be used over and over.﻿ How do you store and protect your cards? Happy Monday, a Mojo Monday to boot. I love an excuse to get creative. My card has sparkle and the camera missed it :(. Really I can't blame it on the camera but the sentiment and the flower are both embossed with a Metallic brown embossing powder with glitter in it. Very pretty. 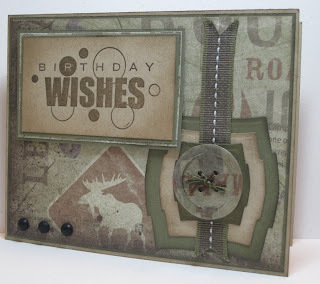 Supplies: Cream and brown cardstock, Designer Paper-Memory Skor, The Stamps of Life-Limited Edition #5, Spellbinders-Ribbon Tag Trio, Stampin’ Up!- Misc punches, Seweasy-Floss, Metallic- Embossing Powder, Kaisercraft Pearls. I usually don't struggle with masculine cards, but I made it half way through this one and hit a road block. I have spare card parts everywhere on things I tried. As luck would have it I half way through cleaning the house last evening I had an idea :). Talk about down to the wire. The card all in all is simple, my husband loves motorcycles so the theme was easy enough to decide. I had in my large stash of paper a Designer Paper pack from Close to my Heart called Passages. I stamped the motorcycles with VersaColor Pinecone then embossed them with clear embossing powder. The wheels are just random clipart that I coated in Versamark Dazzle Champagne then embossed with clear powder and used foam tape to make a double layer. The wheels are not glued down but can slide along the card held in place with the Seweasy floss. The picture does not show the card to its full glory. Supples: Craft cardstock, Designer Paper- Close to my Heart, Stampin' Up!- Motorcycle, Seweasy floss- dark brown, misc clipart.